Running Away to Join the Circus! 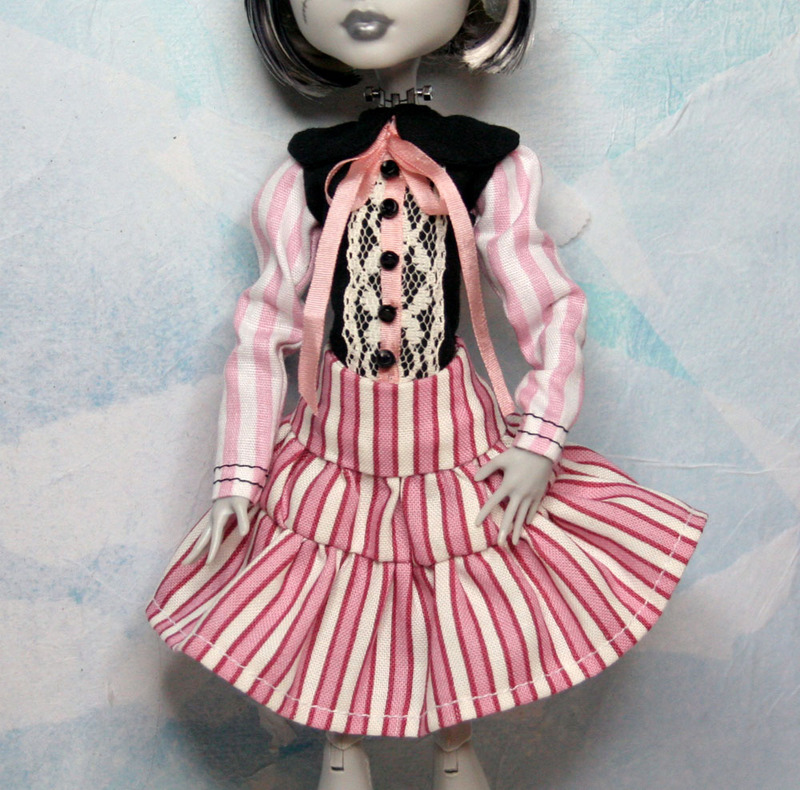 Yoked skirt made with 100% cotton in pink, red and vanilla stripes. The body of the blouse and its large peter pan collar is made from thin black cotton gauze. The sleeves are made with cotton candy pink and white striped cotton. There is hand applied vintage ecru lace, silk ribbon and tiny black shank buttons down the front. Both pieces close with a snap in the back. We go back to Mom's for more clean up tomorrow (Friday). After that I am taking 2 weeks off to sew, while my brother takes 2 weeks to get his Rat Rod Adult Big Wheel ready for action at Viva Las Vegas. If he doesn't sell it before I get there to take photos, I will share his creation here. Remember, add a comment and get an entry for the drawing. I have been adding to the PB Fun Pack. Lots of little goodies going in there. Thanks Again to all who have sent me emails and been so supportive. I am grateful. what a cute little outfit! !It's good to hear that you'll be taking a break, I'm sure it'll feel good to get if off your mind at least for a couple weeks :). That outfit is great! I look forward to seeing your next creations! :) It's nice to hear from you PB.